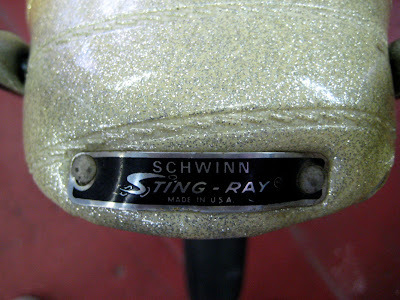 Parts of 3 Schwinn Stingrays, shoe not purchased this week - it is on my foot. After almost 20 years of weekly garage saling, I am still stupidly excited every Saturday as I head out to plunder my beloved Burbank. Like pirates on the high seas, like Indiana Jones, we follow our sketchy maps that guide us to certain treasure. These suburban expeditions pay dividends far beyond the bounty hauled home. What am I looking for? Pocket knives, air guns, office supplies, ink for my printer, pre-1990 skateboards, bicycles, automobiles, netsuke, hot rods, anything from the storied outfitter Abercrombie & Fitch, photographs, oil paintings, quartersawn oak, plants, furniture from laboratories, scientific equipment, Corgi toy cars, board games, old dice, work clothing, anything from Marshall Fields, items related to Los Angeles, magnifying glasses, tools, tackle boxes, mechanical calculators, "Asian" artifacts, Blackwing pencils, shop keeping equipment, postcards, books about the desert, reptiles and homesteading, tansu, lamps, National Parks, treasure hunting or gold mining, electronic components, period speed equipment, aircraft surplus, lighters, items related to the New Yorker, miniature buildings, drawer knobs and pulls, circus ephemera, items related to automobile racing, interesting glass jars, examples of fine illustration, 78 RPM rock, jazz and blues records, blue and white china, curiosities, switchblades, fine rugs and carpets, anything made of wormy chestnut, interesting tin cans, Stewart Warner gauges, tapestries, mattress ticking, old denim, leather jackets, Redwing boots, model kits of buildings, old table fans, cast iron, toys, items related to the Apollo space program, books by Jacques Cousteau, movies, croquet sets, CDs, interesting flora or fauna, tube amplifiers, pro audio equipment, fireworks, recent Macintosh hardware and software, machinery, anything from Kerr's Sport Shop and a thousand other gems from the wreckage. The most exhilarating are those unexpected items that capture you immediately, that you pick up and examine for the first time in decades, that are heavy with the hands that held it before you. Beyond intrinsic value, these rare items are special beyond their estimated eBay sale price. The Stingray is a swell find, but it is nothing profound. 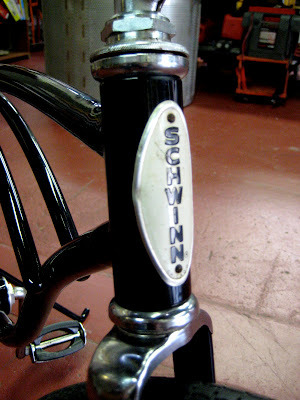 Through all the years of garage saling, I have always wanted, but never found, a Schwinn Stingray. Previously, I have encountered only three. 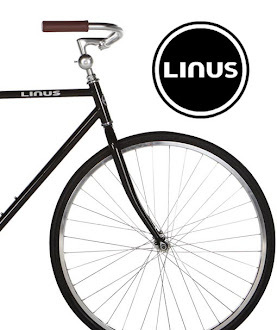 One was being wheeled away from a sale as I approached, another was a pile of parts that a fella was carrying to his car in a laundry basket and the third was a sand blasted frame which I purchased. So, this week, I found the assortment of parts shown in the top photograph. This is not a treasured Stingray rescued from the rafters of grandma's house but, rather, a stalled project that somebody had put together over a couple evenings of drunken eBaying. Recently, I have figured out that we are in an odd secondary era for this stuff. 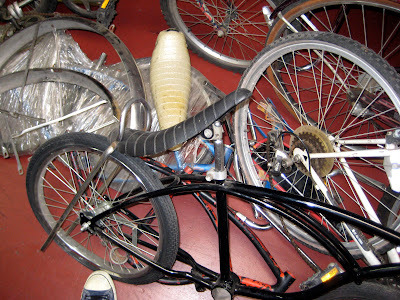 During the 1970's and 1980's, garage sales were probably lousy with Schwinn Stingrays, but those virgin bicycles have long been sold, garage saled, garbage dumped or reclaimed by the original owner. Now, when we find novelty bowling statuary, Apple IIs or strike front matchbooks, they are being sold by somebody who paid through the nose on eBay only to get tired of it for the second time. Although the ironic 50s/60s kitsch trend was long lived, I would say that it is finally grinding to a halt, if we are to draw any conclusions from the quantity of television lamps and ceramic figural panthers congregating at garage sales. Personally, I am thrilled to move from the so-bad-it's-good era and advance to the so-good-it's-good period. Of course, it is often the same stuff, but the intent of the owner is decidedly less obnoxious. From the detritus, I was to assemble one reasonably complete, reasonably correct Stingray. 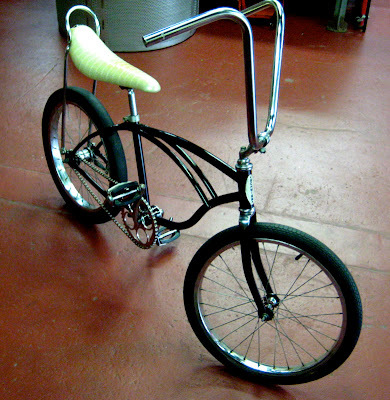 Sure, the pedals are the incorrect era, it is missing a sissy bar clamp, has the incorrect stem and handlebars and is missing the chain guard, but it certainly has the basic look.